M22070 - Carved HDU Cabin Address Sign "Suspended"
This residence address "Suspended" sign was first carved, then the background wood grain texture was made by sandblasting. The trees were painted solid green by client request; we could have painted it in natural colors. 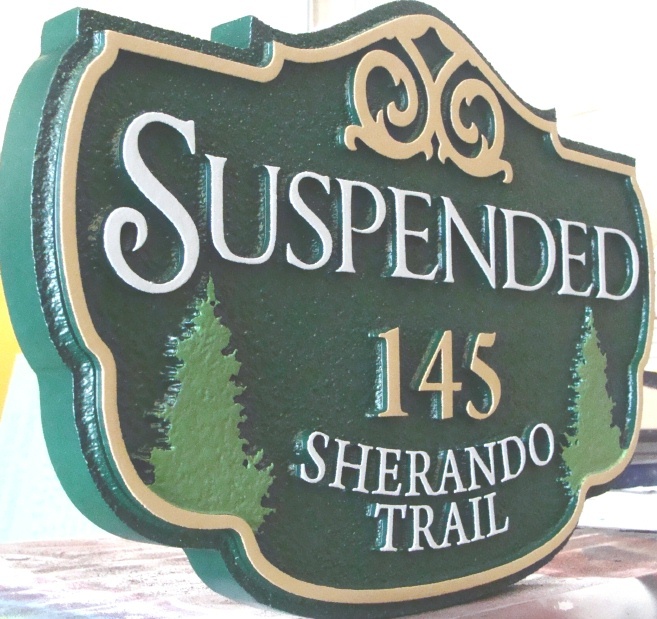 This sign is made from HDU, but can also be made from wood.This outdoor sign is clear-coated twice as extra protection against UV radiation and rain and snow.The sign can be mounted on a wall or fence, on a post or between two posts, or hung from a wood or iron hanger from eye-hooks on the top.